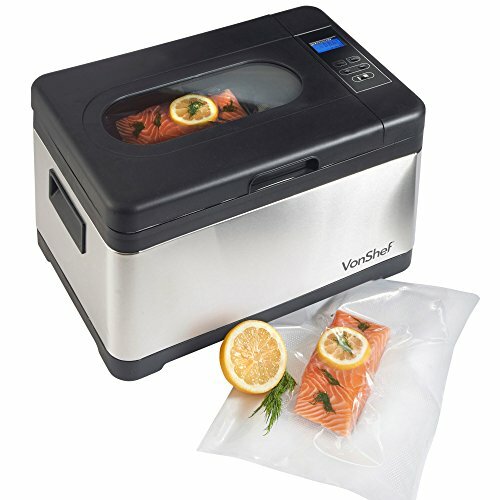 get a Sous Vide vacuum sealer. We've reviewed 5 of the best and most stylish. 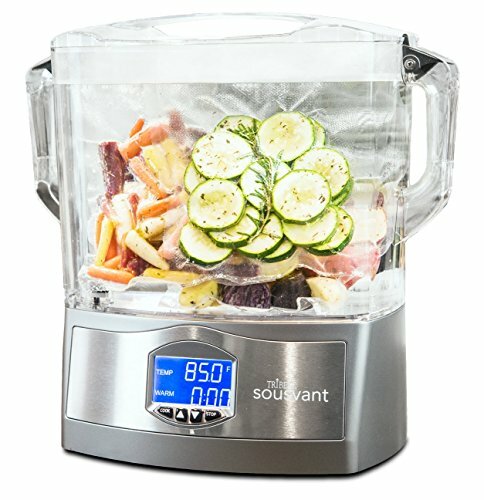 Why Buy A Sous Vide Machine? Sous Vide – which translates as “under vacuum” - is a style of cooking developed by French chef Georges Pralus, where food is sealed in a vacuum pack, and heated to a precise temperature in a water bath, or bain marie – and then served – more succulent and tender than food cooked any other way. Sous Vide is ideal for steak or fish, both of which are easy to overcook using traditional methods. It can also be used for vegetables, although it is recommended that vegetables are cooked on a skillet and added to the Sous Vide pouch about five minutes before the meat is cooked through. For many years, Sous Vide was a closely guarded secret, shared only among elite chefs, but now, with the ease of a Sous Vide machine, you, too, can enjoy gourmet standard food quickly and easily in the comfort of your own home. So, whether you're after smooth steaks or succulent salmon, there's bound to be a Sous Vide machine that's perfect for you. We've reviewed a few of them to help you create your dream kitchen. 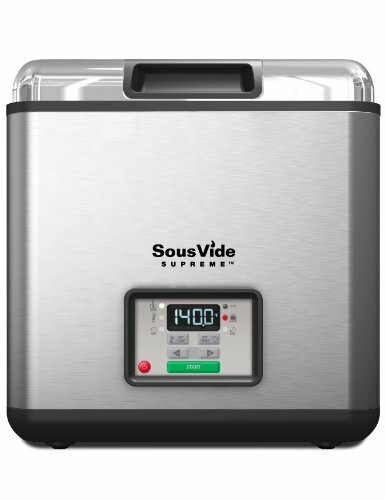 The Sous Vide Supreme SVS-10LS offers you the opportunity to cook almost any food, from meat to vegetables, to gourmet standard, using the pouch rack (included in purchase price) to add in different parts of the same meal at the same time. It also includes recipes for several one-pot meals that are suitable for cooking together, with more being developed to offer the best-value experience. The Sous Vide SVS-10LS features a digital LCD display, which some people have commented can be hard to read, a pouch rack, and full range of accessories. It is durable in construction, and accurate to 0.5 degrees Celsius, with a lid that doubles as a quick and easy way of transporting food from the Sous Vide to plate. Some commentators have noted that the lid is somewhat flimsy, and doesn't fit flush to the main body of the machine. It has also been noted that, while the Sous Vide Supreme is good overall, it would benefit from an integral drainage facility, rather than the user having to empty the machine themselves after each use. 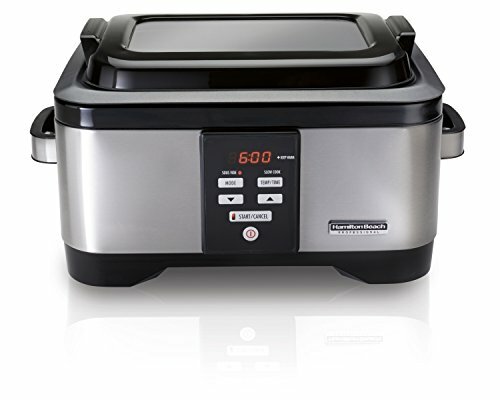 The Hamilton Beach 33970 provides a slow cooker and Sous Vide machine in one, with a tempered glass lid so you can easily keep an eye on what's cooking. It also comes with a non-stick inner, making cleaning a breeze. Some people have suggested that it seems a little large for a counter top machine, but, all in all, the Hamilton offers a good basic Sous Vide machine for the home cook. In the Gourmia GMC-650R we have a Sous Vide machine and multi-cooker, with the ability to produce anything from a succulent roast to yogurt to restaurant standard. 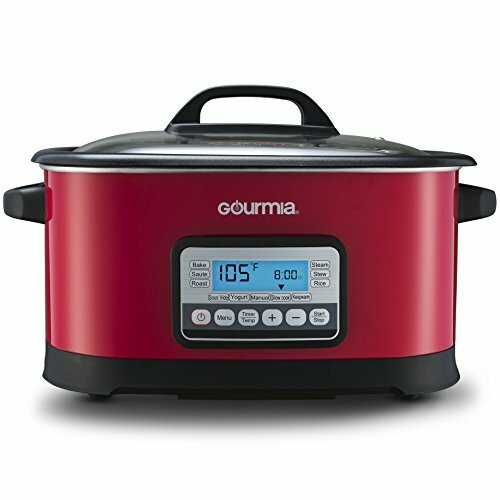 The Gourmia includes a free recipe book, so you should know exactly what you're doing, and offers non-stick functionality in an attractive red stainless steel design, with an aluminum pot, offering all round easy cleaning. There is also an LCD display for ease of use. The VonShef Premium is an excellent size Sous Vide machine for the average home kitchen, but does let itself down with poor integral circulation, significant temperature fluctuations, and a difficult-to-use control system. As Sous Vide cooking relies on exceptional levels of accuracy, it may be worth investing in a different model. Finally, the Sousvant SV-1X1, from Tribest presents a sleek, user-friendly design, with a built-in safety indicator, and removable carafe for easy cleaning. For the dedicated amateur chef the Sousvant may be ideal, although some people have commented that it is somewhat oversized for counter top use in the average kitchen. The Sousvant has also been criticized for not coming with instructions, which is not ideal for the first-time user. Whether you're a regular dinner party host looking to impress, or you've got a one-off special occasion coming up that you need to go down perfectly, a Sous Vide machine, and the succulent, perfectly cooked, gourmet-standard food it produces, with no effort on your part, may just be exactly what you're looking for – simply pop your meat, fish, or vegetables in a food-safe vacuum bag (these usually aren't included with the Sous Vide machine, but can be easily purchased separately), set up the Sous Vide, slip the pouch in, and leave the Sous Vide machine to do the rest With a Sous Vide machine, you can easily be the envy of your dinner-party circuit, or quickly impress those important contacts, or potential in-laws! While millions are feeling a drop in their disposable income, not everyone is simply giving up and accepting that they will have to do without life's little luxuries. 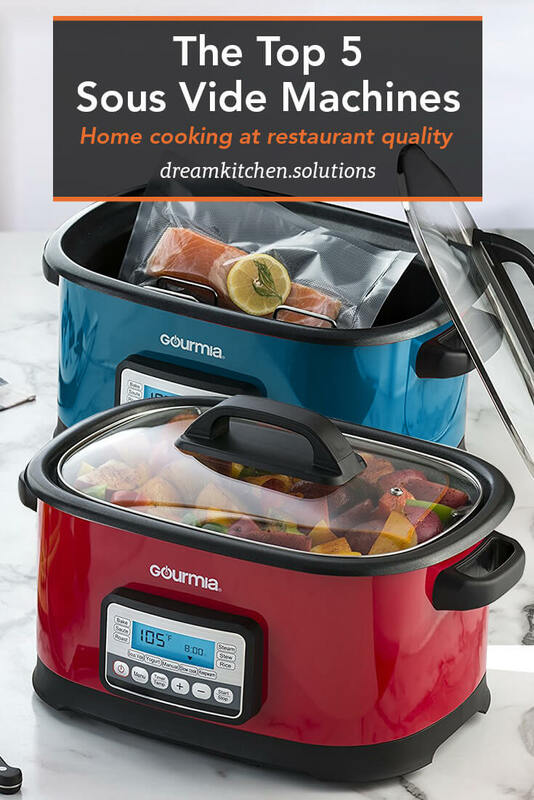 While regular meals out may have to be a thing of the past, it is still possible to enjoy restaurant-quality food for a one-time investment in the right kind of home kitchen accessories. As well as being a means of continuing the enjoyment of luxuries, home cooking is a far more sustainable and healthy method of enjoying gourmet food – you have the opportunity of knowing exactly where your food has come from, and exactly what has gone into your meal – something that's not always the case, even at the best restaurants. Sous Vide cooking relies on extremely accurate temperatures, and, while these may be achievable with a basin of hot water and a basic thermometer, it is far easier, and less time-consuming, to use an automated Sous Vide machine, which you can just load up and leave – giving you more time to get ready for your dinner party, or finish those last few reports. Whatever you decide or need to do, a Sous Vide machine gives you plenty of time to yourself, out of the kitchen, whilst ensuring that the end result is food that will taste better than almost anything else, and is guaranteed to wow your friends and family.